A secret sharing scheme permits a secret to be shared among participants in such a way that only qualified subsets of partecipants can recover the secret, but any non-qualified subset has absolutely no information on the secret. The set of all qualified subsets defines the access structure to the secret. 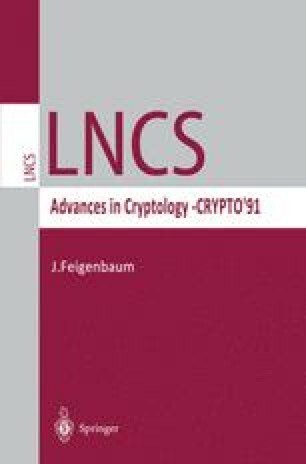 Sharing schemes are useful in the management of cryptographic keys and in multy-party secure protocols. We analyze the relationships among the entropies of the sample spaces from which the shares and the secret are chosen. We show that there are access structures with 4 participants for which any secret sharing scheme must give to a participant a share at least 50% greater than the secret size. This is the first proof that there exist access structures for which the best achievable information rate (i.e., the ratio between the size of the secret and that of the largest share) is bounded away from 1. The bound is the best possible, as we construct a secret sharing scheme for the above access structures which meets the bound with equality. This work was partially supported by the Italian Ministry of the University and Scientific Research, within the framework of the Project: Progetto ed Analisi di Algoritmi and by the National Council of Research, Progetto Finalizzato Sistemi Informatici e Calcolo Parallelo.